The lawmaker representing Delta Central, Senator Ovie Omo-Agege, on Wednesday morning resumed at the senate chamber. After signing the attendance register, he proceeded to the upper legislative chambers where the lawmakers are now in a closed-door session which began shortly after the Senate President, Bukola Saraki, said the opening prayers. Omo-Agege, who was suspended for 90 legislative days over a comment allegedly tarnishing the image of the Senate, failed to show up for plenary on Tuesday. He was, however, summoned alongside Senator Ali Ndume to explain their various roles in the event of the snatching of the senate mace. They are to put their defence forward in today’s plenary. 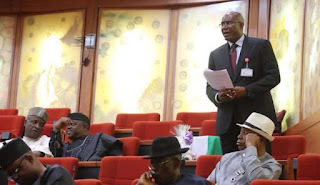 The Senate leadership had on Monday night resolved to comply with the judgement of the Federal High Court on the suspension of Senator Ovie Omo-Agege.